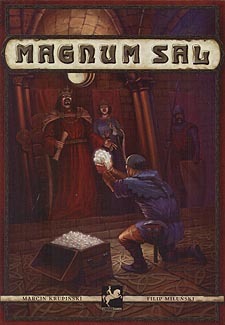 In the game of Magnum Sal each player takes the role of a foreman - the manager of a mining team. During the game, players will try to extract salt most efficiently from the mine, sell their "white gold" at the market,and above all complete the king's salt orders. The player who earns the most money from extracting salt receives the title of Royal Steward and wins the game. a race against time, against water accumulating in the mine passages, and against the other foremen. This game has some lovely components and artwork. Players control a mining team trying to complete the Kings orders for profit. There are different types of Salt worth different amounts, there are several different buildings which can only be visited once per turn. The buildings have various functions such as purchase of tools (which give once per round abilities), removing water cubes, buying and selling cubes at the market, hiring more miners, and going to the palace to complete a contract. The game is played over 3 phases with new contracts and tools placed each time. The tools provide extra actions (but once used are flipped over until the next phase) to aid the players, they also provide an income at the end of the game. The winner of the game is the player with the most money at the end of the 3rd phase. The Phase changed is determined by the number of contracts completed at the Palace, when the 4 or 5th contract is completed (Determing by the number of players) each following player back to the start player gets one more turn then the board is reset. There is a lot going on here and a really fun game to play, this works very well as a 2-player games as it does a 4 player.